Are you looking for a great car-free day trip from the Seattle area, perfect for kids age 1 – 7? 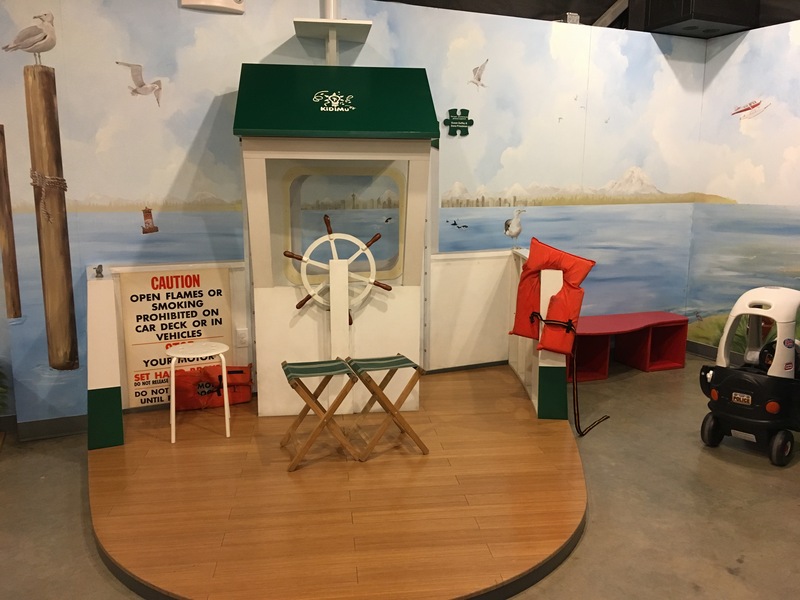 Ride the bus to the ferry terminal, then hop on a ferry to Bainbridge Island, check out the Kids’ Discovery Museum, stroll into town for a snack, and catch the ferry and bus back home. (See travel tips below.) From downtown Kirkland, we can do the full trip in as little as 6 hours. Last week, we got on a bus at 11:30 am, and were back home at 7:30 pm after a great leisurely day of travel and fun. The museum is a short walk from the ferry terminal. (directions below) They’re open Monday through Saturday 10 – 4, Sundays 12 -4. Admission is $8 for adults and children (babies under 1 year are free), with discounts for senior and military. 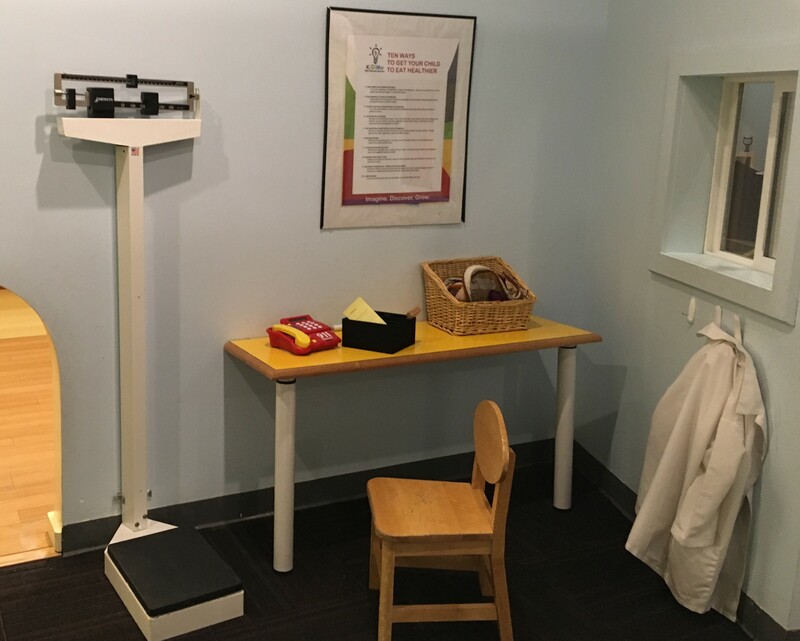 The Museums for All rate is $1 per person with proof of participation in EBT, CHIP, Provider One or WIC. (Info current as of July 2018.) You could see / do everything in the museum in an hour. We relaxed and settled in and played for a long time and were there for about 2.5 hours. 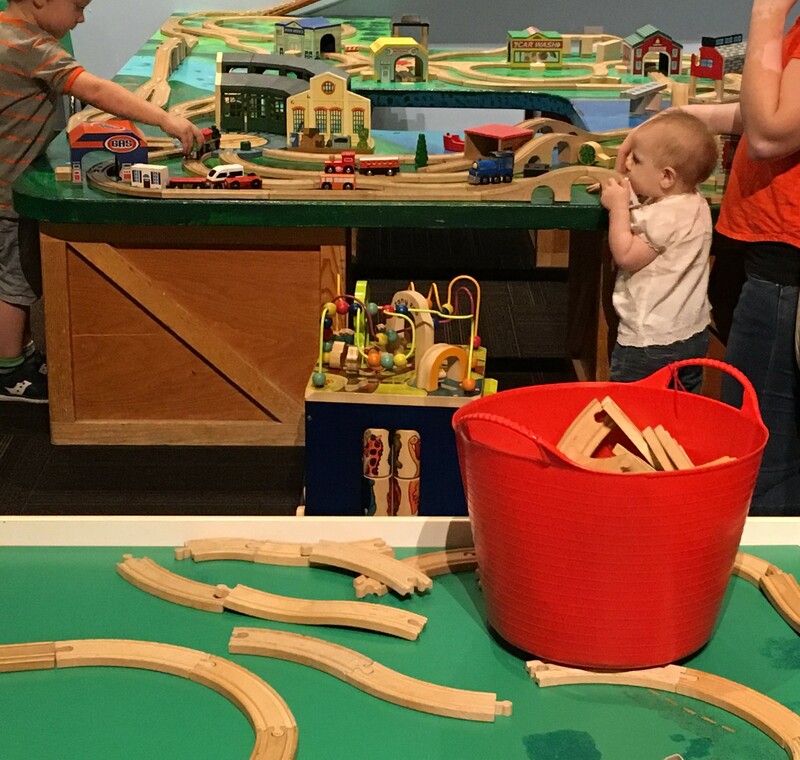 It is best aimed at 3 – 6 year olds, as are all Children’s Museums, but fine for toddlers and still engaging for my 7 year old. Just inside the entrance, you’ll find a small gift shop area and this climber. 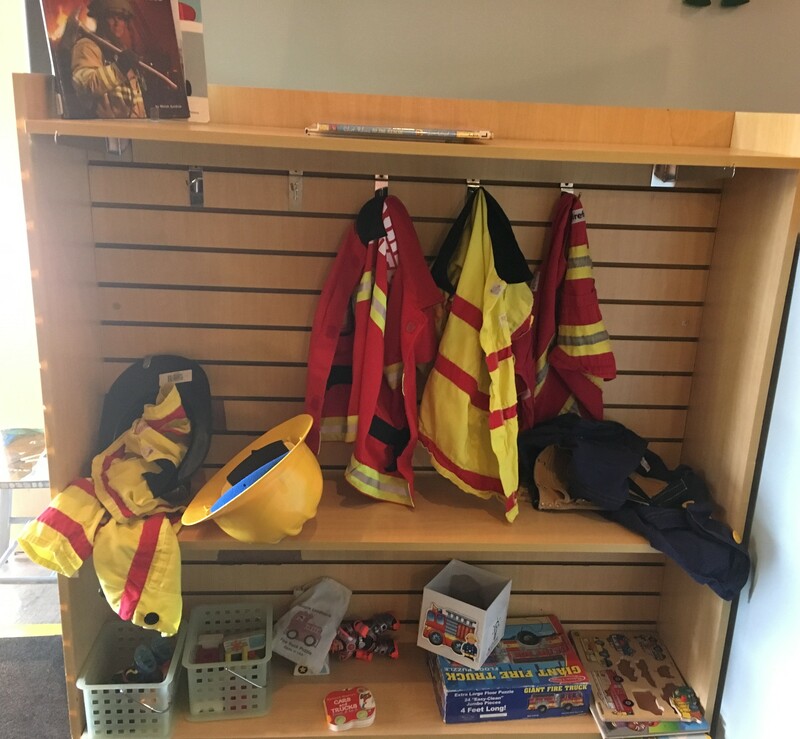 Tucked behind it is a dress up zone, currently stocked with firefighter costumes and books. 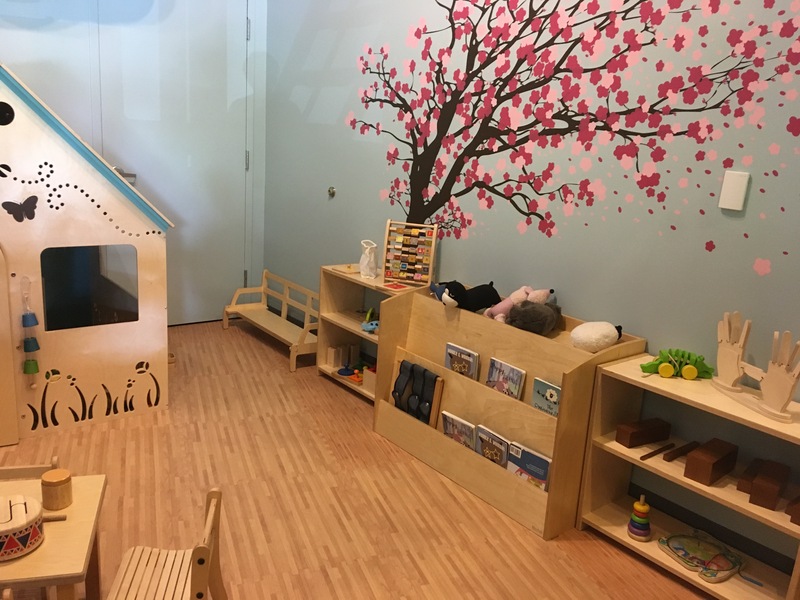 This is the toddler area, with toys, story books , musical instruments, and a playhouse. 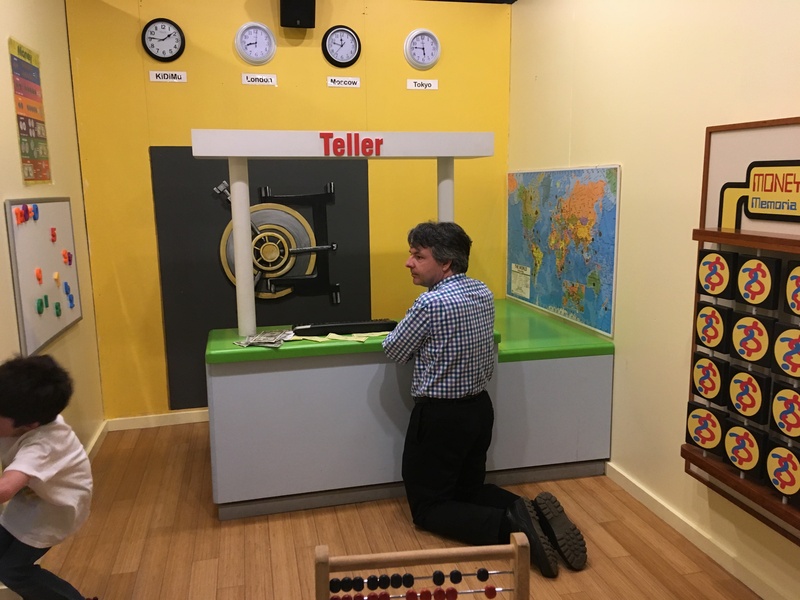 The first room is bank themed. It included play money, an abacus, a world map, and clocks set to different world time zones. 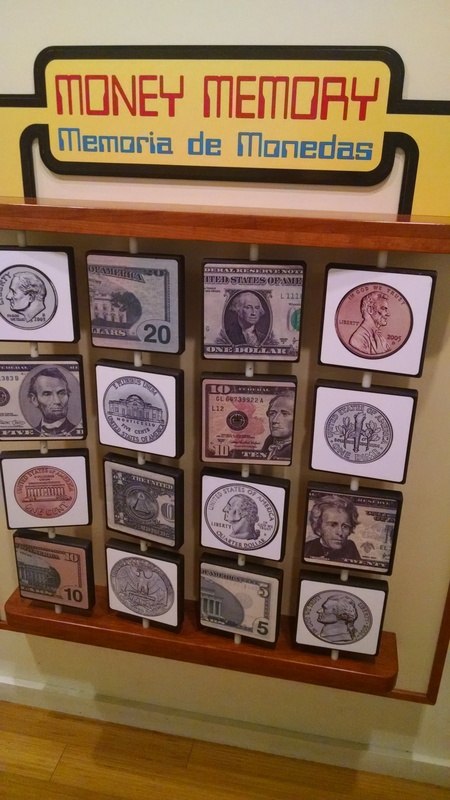 There was a memory game where you had to find and match a picture of the front of a type of money with a picture of the back of it. You start with $20, and when you spin, you may earn a few dollars (by gathering recyclables, washing cars, or caring for a cat) or spend a few dollars (buying a gift for a friend, or repairing something you’ve broken). 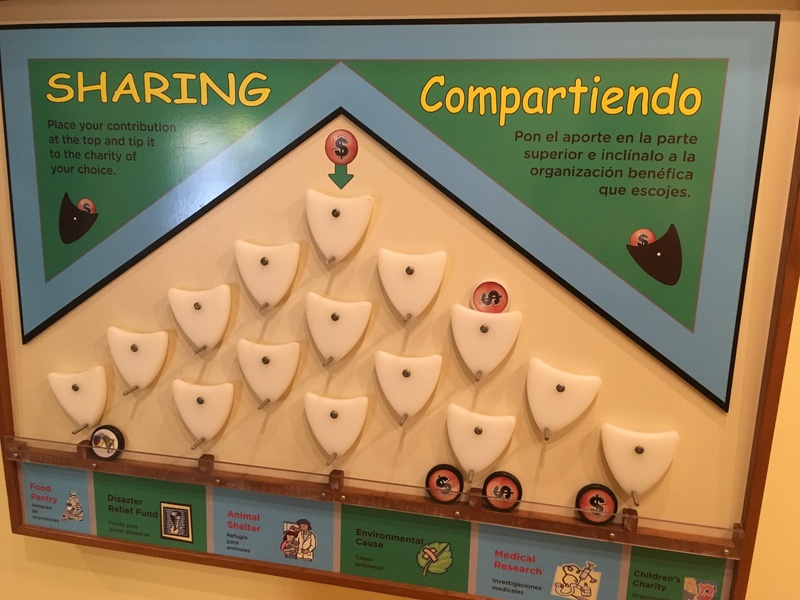 Some of the wedges were about making a choice about whether or not to buy an optional item, and you spun the middle spinner to decide. 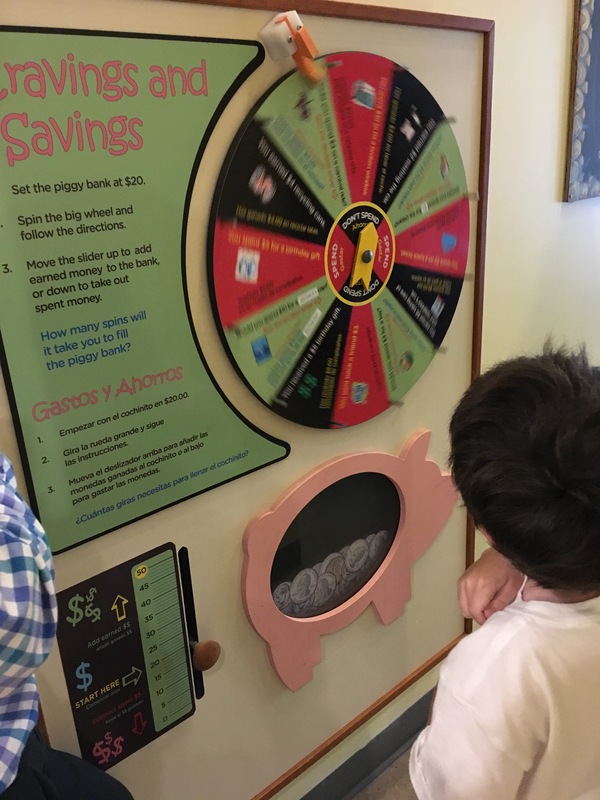 Our son was engaged for quite a while, and has talked about this often in the days since the trip as he makes real decisions about whether to spend his allowance or not. There are posters and rugs showing the different systems of the body (skeletal, digestive, etc. ), a pretend sink and fake teeth with information on the importance of hand-washing and teeth-brushing, and an exam table with a doll patient and pretend medical equipment. 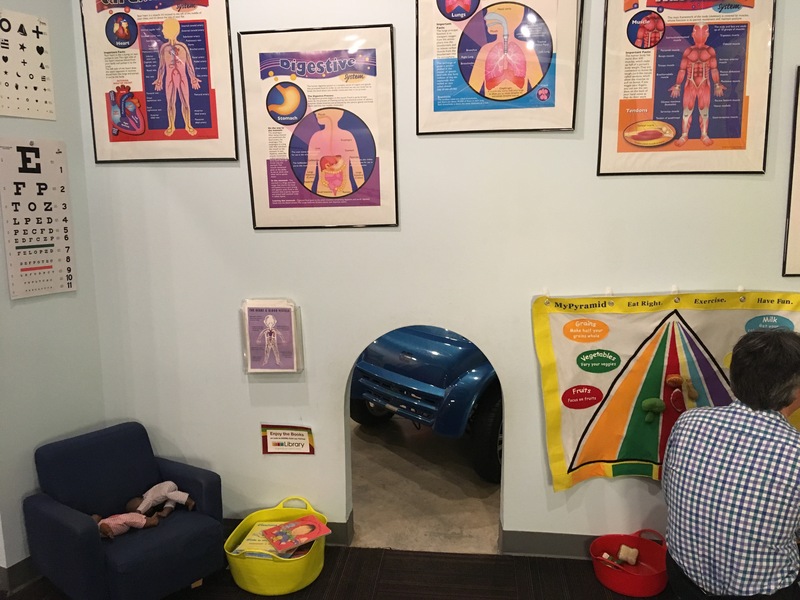 There’s an eye chart, a waiting room chair with books to read, and a food pyramid where there’s play food to velcro to it, which you sort into the correct food group category. There’s a scale, a lab coat, and an apron your child can put on where you can attach stuffed organs (liver, heart, etc.) to the right place on the apron. 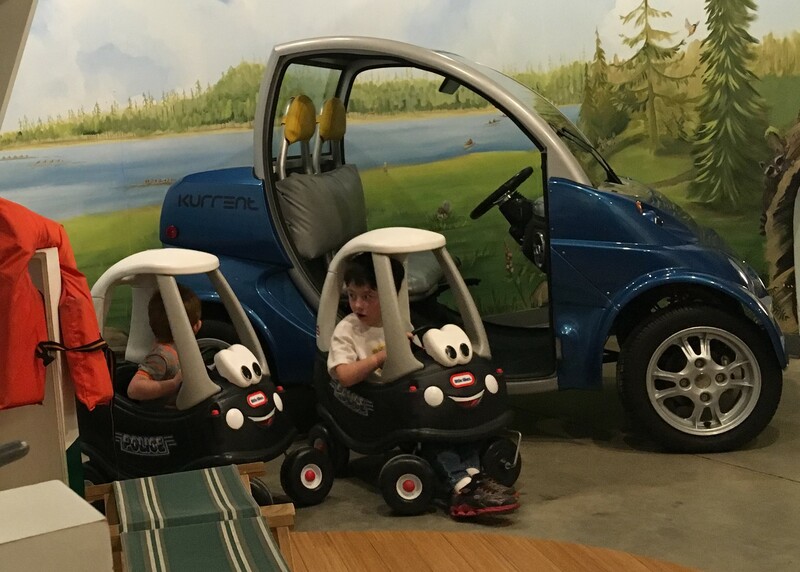 This features a small electric car they can climb into and pretend to drive, and little plastic cars they can paddle around in. Plus a pretend ferry boat to capture the island experience. This featured Fort Blocks, which I hadn’t seen before. The cool thing about them is they are big, and you can build pretty big structures with them. 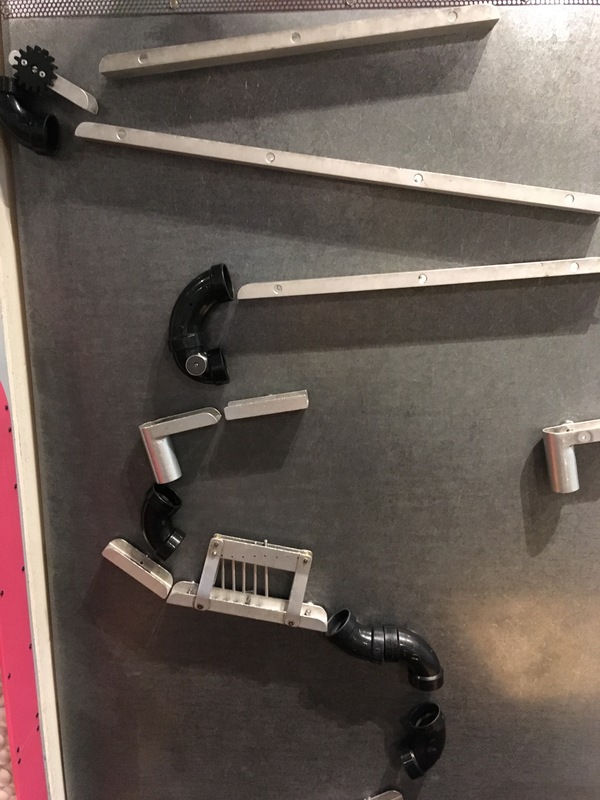 The down side is that even for our seven year old who has experience with a lot of building tools, they were a little tricky to assemble… he could build a wall of them, but couldn’t really figure out how to get them together to form a 3D cube. My son LOVED the grocery area when he was four. At age 7, he passed it by. 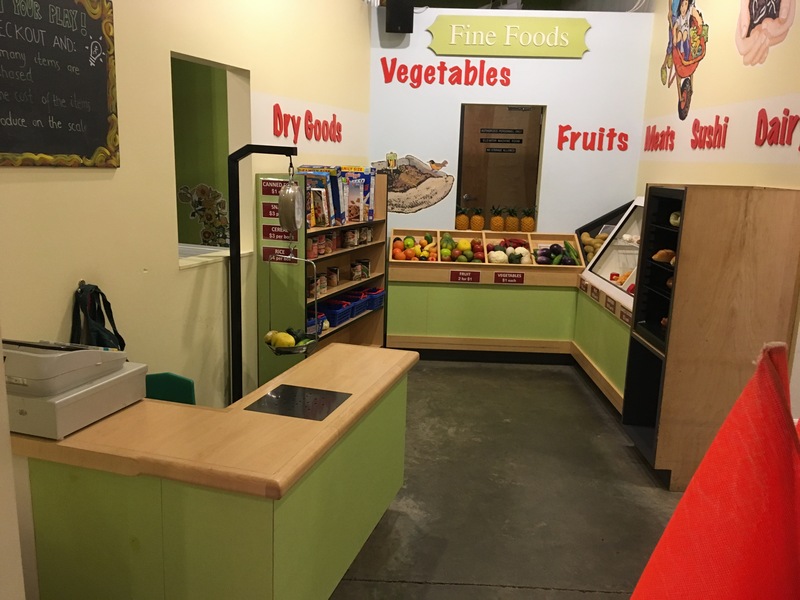 But it’s a nice grocery area, with plenty of plastic foods and food boxes to weigh, to load in your bag or cart, and to check out at the cash register. 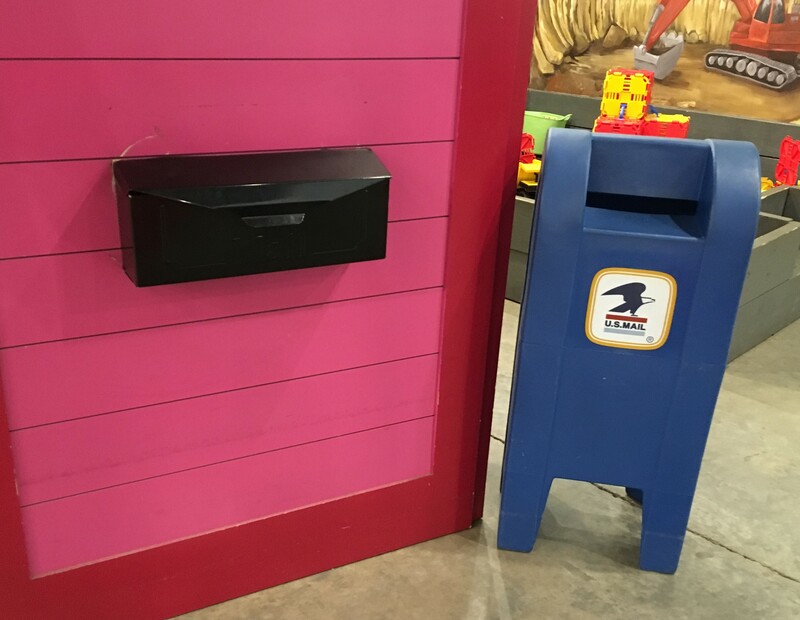 Outside the store was a mailbox, with pretend letters to put in and take out, and there were several residential style mailboxes on walls nearby so your child could “deliver the mail.” I can see a three year old loving this play opportunity! 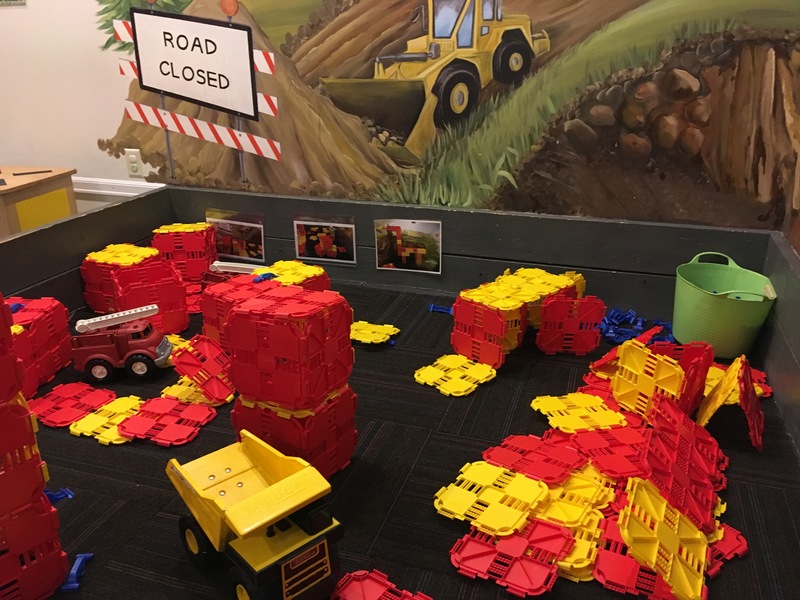 They have a climbing wall, gravel to load into buckets and dump trucks and transport around the area, and a water table. 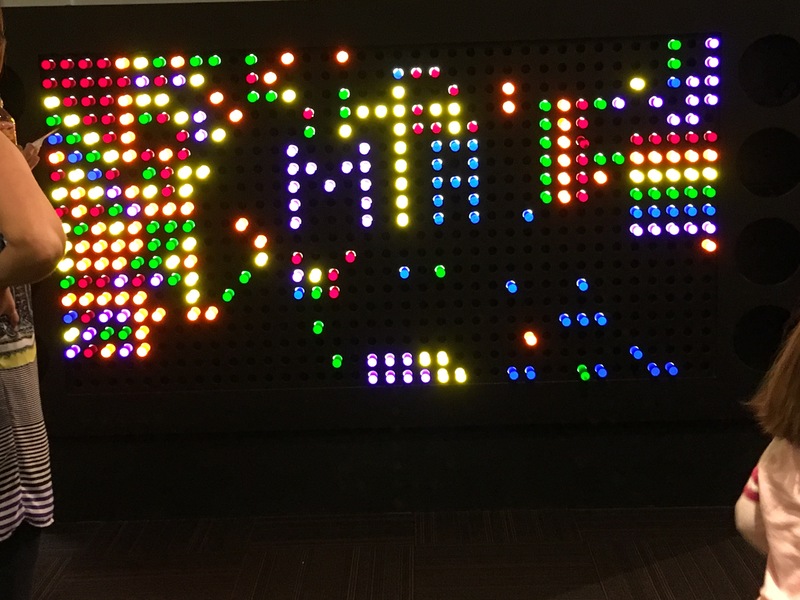 There’s a giant Lite Brite board (where you push the colored pegs into the board and they glow) which appeals to ages from toddler to adult. 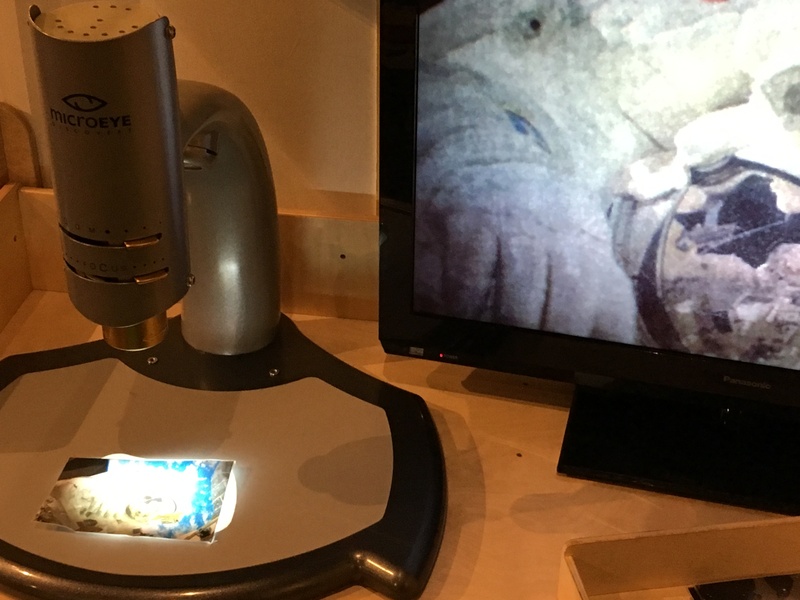 At the Magnifying Madness station, you place a card under a microscope and the image is projected on the screen. We had fun bringing up a family photo on our phone and placing that under the microscope to project. and then a large track layout for playing on. 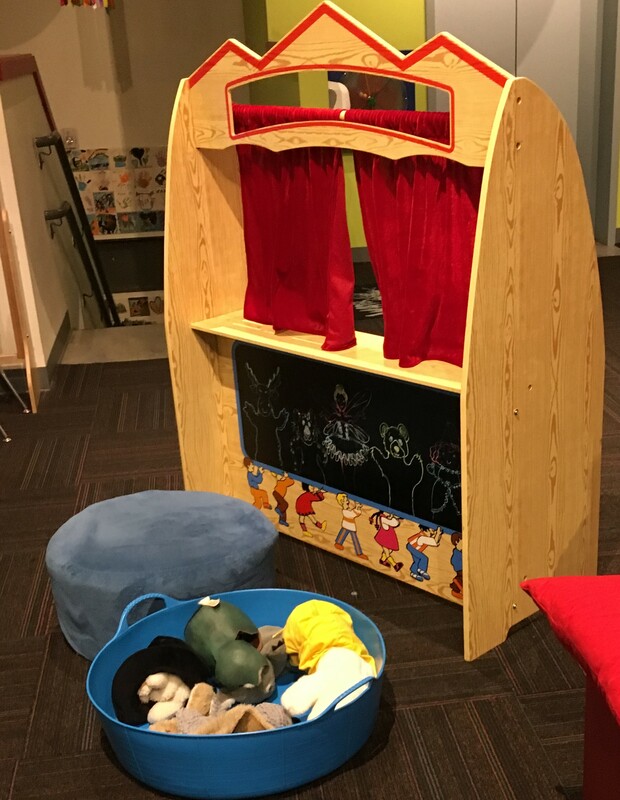 There’s a puppet theater for putting on a show, with books nearby for inspiration. And blue foam blocks for building. 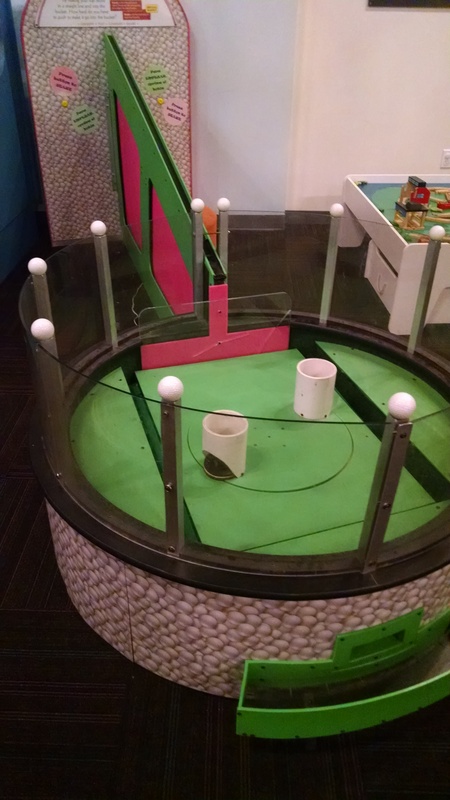 The remainder of the upstairs area is Motion Madness – Fun with Physics where there are several different exhibits to explore motion with golf balls. This is our favorite part! There’s this tower, where you simply place golf balls on the track at the top, and they roll down. 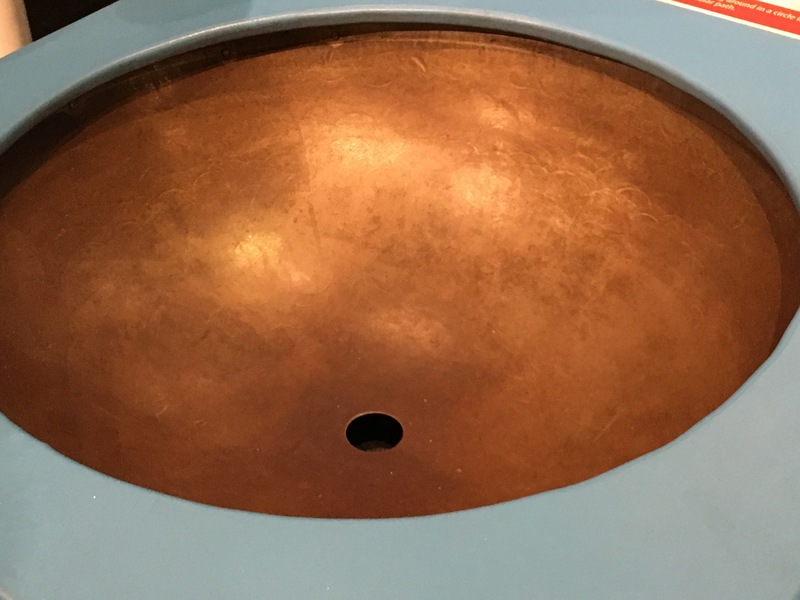 There’s a gravity well, where you drop the balls in and they spin round and round before falling through the hole in the middle. 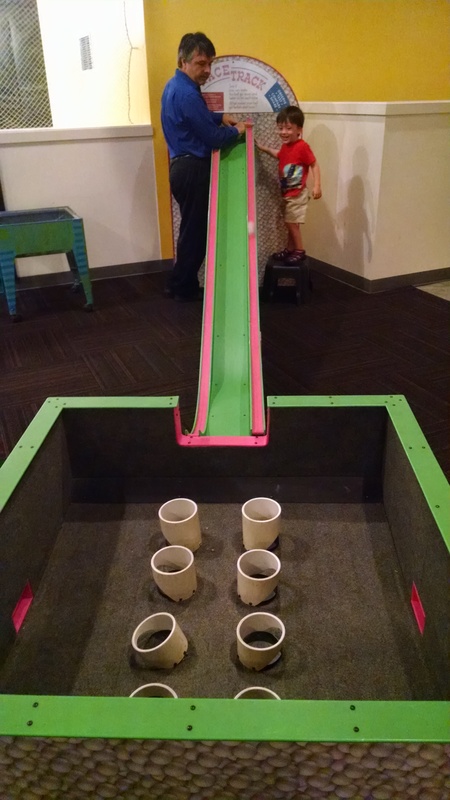 A skee-ball style ramp game. 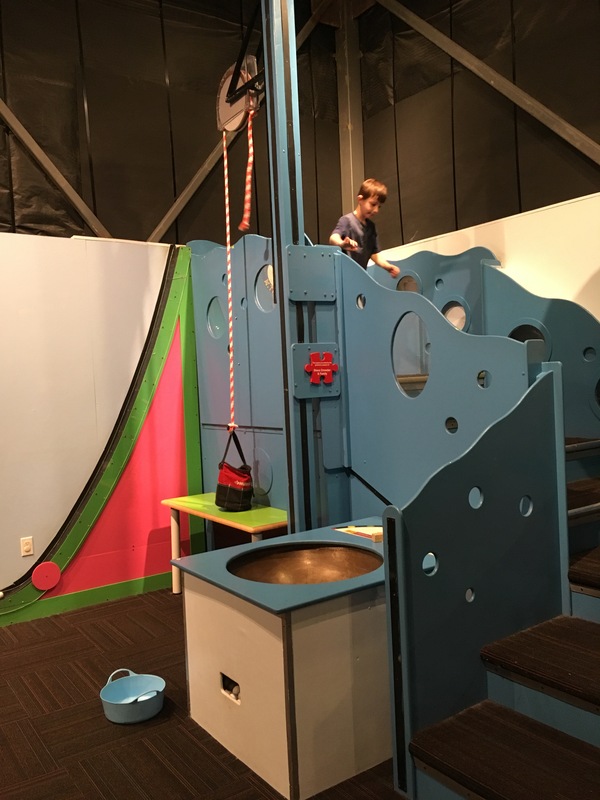 Another ramp that has a rotating platform at the bottom, where you have to time your ball drop just perfectly in order to get the ball in the cup. And, my favorite… a tall platform you climb stairs to get to. There’s a basket on a pulley that you can load up with balls at the bottom, then use the rope to haul it up to the top. From the top, there’s a giant ramp to send the balls down. When you finish at the museum, it’s easy to take a short walk into town (Winslow) for treats. We saw a pizza place, many lovely looking restaurants, wine-tasting venues, and a bakery. (Here’s a dining guide.) We decided on ice cream at Mora. There was a huge line outside, but they had seven people on staff, and moved us through quickly. And the ice cream was great! We had the dulce de leche and the strawberry cheesecake. Next door to Mora was a crepe place, and we were tempted to try that… maybe next time. After ice cream, we did the 0.5 mile walk back to the ferry for our trip home. 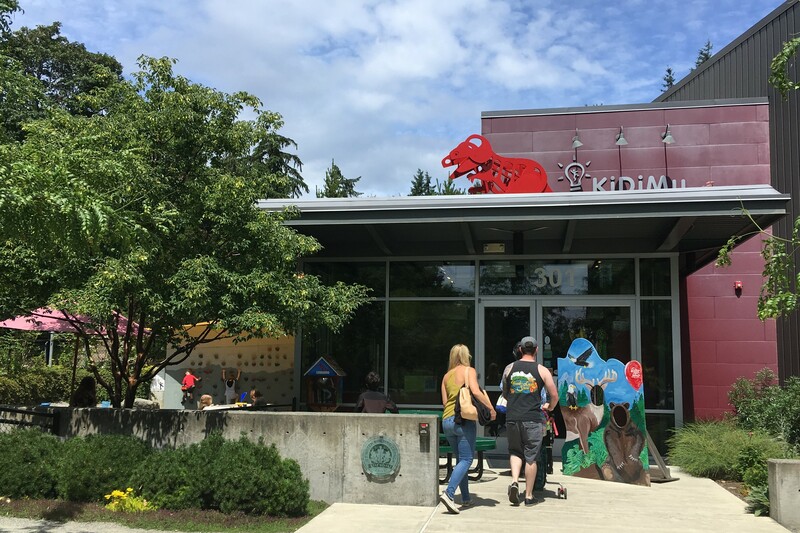 Next door to the Children’s Museum is the Bainbridge Island Museum of Art, which offers free admission. In the downtown area, there are also many art galleries and gift shops, which looked quite nice, but we’re not really a shopping family. (Although Eagle Harbor Books was a very tempting option.) If you choose to bring a car and/or stay longer, you’ll find lots of info about lodging and activities at www.bainbridgeisland.com. Use Metro Trip planner (or Google Maps or whatever) for directions to the ferry terminal in downtown Seattle (Colman dock). In our case, the easiest route is to take a bus to the Pioneer Square station in the bus tunnel, then walk 0.3 miles to the terminal. The bus fare is $2.75 for adults, $1.50 for kids age 6 – 18, and free for those under 6. If you don’t often take the bus, read How to Ride Metro. Buses can be delayed off schedule, so I also find it helpful to download the One Bus Away app to my phone, which gives up-to-the minute updates on when to expect your bus to arrive. We usually bring a couple books along in case our child gets antsy on the bus. But often he’s happy to just look out the window for the ride. Now, obviously you could drive to downtown Seattle and park, but that would be pricey! 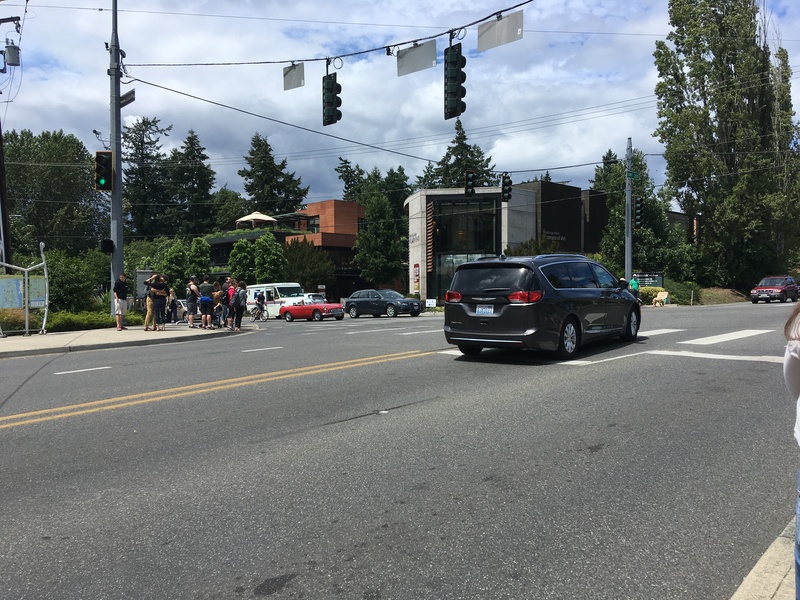 Or you could drive to Seattle and take your car on the ferry – but then you have to be there much longer before ferry departure time, and it’s more money and more effort, and makes this trip actually MORE complicated than just walking on the ferry and walking into town. You can find the ferry schedule here. The ferry runs approximately every hour, but the schedule varies greatly, so be sure to check it if you’re picky about your timing. As a walk-on passenger you only need to arrive ten-ish minutes before a ferry time. There is no need to make a reservation to walk-on, as there’s usually plenty of room for passengers. 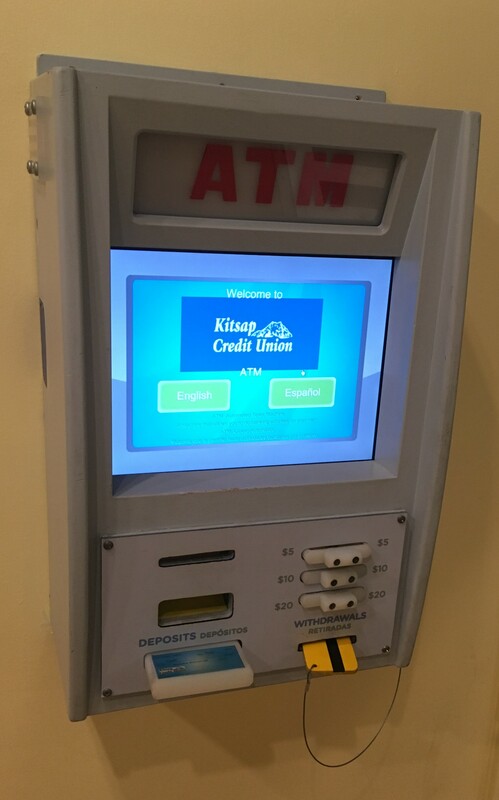 When you arrive, buy your tickets, or use your Orca card. Fares are $8.35 round trip for adults, $4.15 for kids 6 – 18. Here’s a FAQ with more info. The ferry trip is a lovely little cruise across Puget Sound. If you want a preview of what the trip will look like, just go to YouTube and search for Seattle to Bainbridge ferry, and you’ll find lots of videos of varying quality. If you haven’t taken a ferry before, you should! My husband and I had a conversation on this trip, and we think that if someone is visiting Seattle for a few days, the 5 most quintessentially Seattle experience you could have are: Pike Place Market, the Underground Tour in Pioneer Square, seeing the view from the top of the Space Needle, riding the monorail to MoPoP, and taking a ferry. 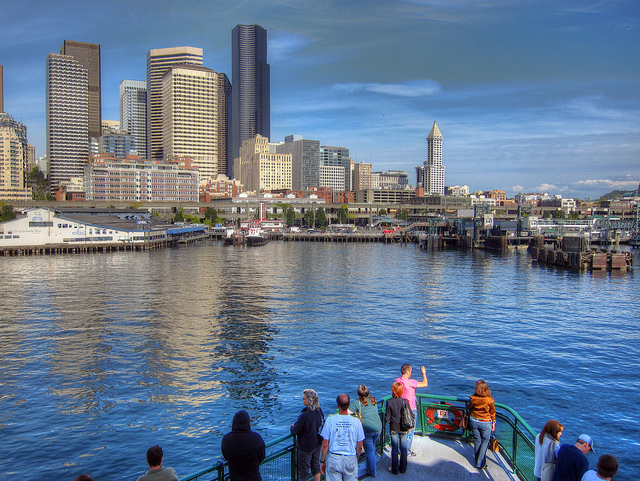 Not that we don’t also love the zoo, and the science center, the aquarium and more, but we think those 5 are the things most unique to Seattle. The ferry crossing is only 35 minutes. We eat lunch on the ferry (Ivar’s chowder and hot pretzels!) and you pretty much have to go straight to the restaurant as soon as you board, get your food, sit and eat, and you’ve arrived. On a nice day, you might instead opt to stand outside on the deck and enjoy the view. If it’s a rainy day, bring along a deck of cards, or you can often find a public jigsaw puzzle in process somewhere on the boat. When the ferry arrives, just walk off with everyone else… this puts you on a road walking straight into town. (Here’s a map to orient you.) In about 1/4 mile, you’ll come to the first real intersection. That’s Winslow Way East. Look across the street to the northwest corner of the intersection – you’ll see the art museum there. There’s a path between the art museum and the building to the west of it. Walk down that path and you’ll come to Ki-Di-Mu. For our family – 2 adults and a 7 year old, it was $7 each way for the bus, ~21 for the ferry, $24 for the museum, plus the cost of lunch on the ferry and ice cream. 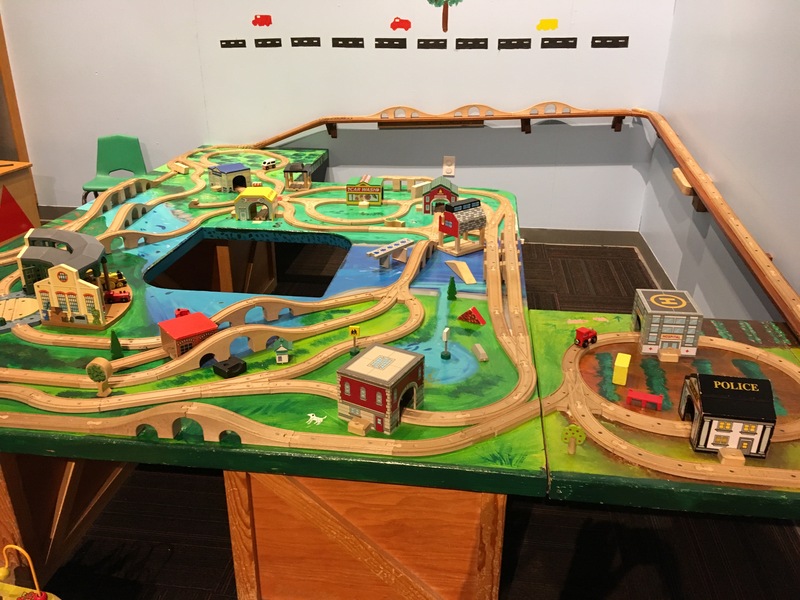 Looking for other ideas for fun activities with kids in the Seattle area? 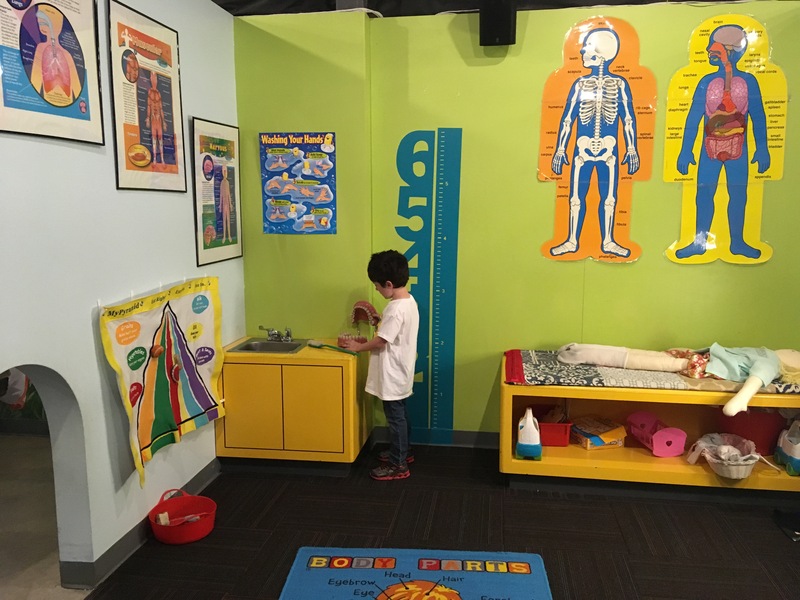 For another day trip to a museum, read about Mindport in Bellingham or check out KidsQuest in Bellevue. 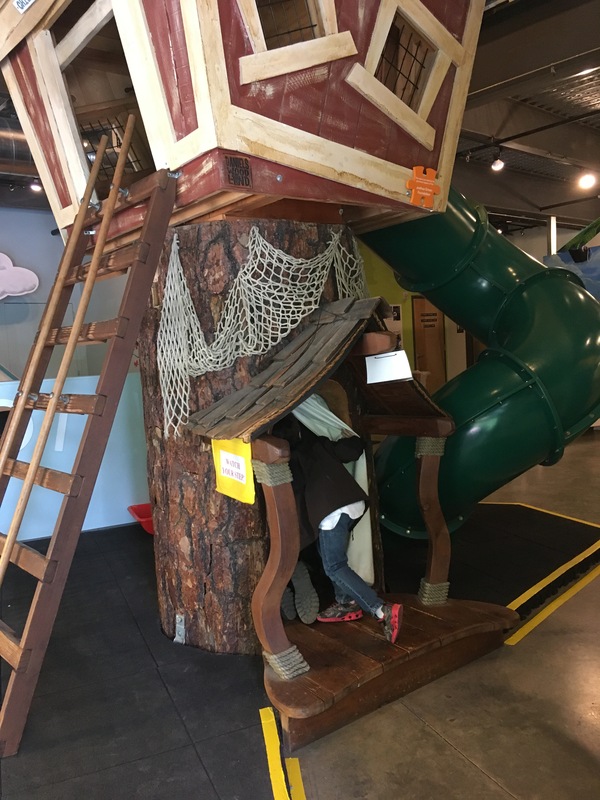 For a unique experience for kids age 5 and up, go build forts with hammers and nails at the Adventure Playground on Mercer Island. Explore parks in Kenmore or Kirkland. See an outdoor play or outdoor movie. Or check out my series on Cheap Dates with Toddlers. For school year fun and learning (for you and your child), consider taking a parent-child class (for ages birth to 7) sponsored by the parent education program at one of our local community colleges. We offer everything from parent-baby classes to coop preschools to art and science enrichment for elementary age kids. 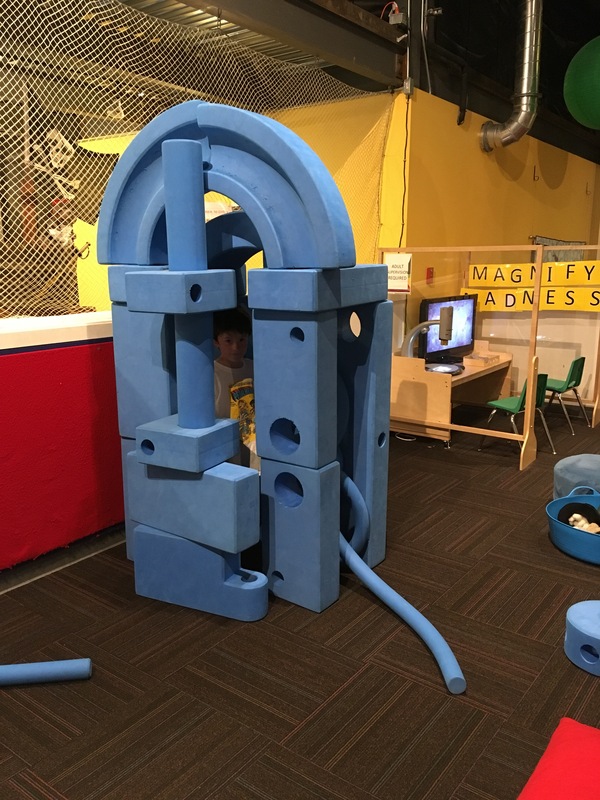 This entry was posted in Play and Fun Activities, Seattle area and tagged Bainbridge, childrens museums, Seattle day trips on July 13, 2018 by Janelle Durham.